IF YOU BOOK FOR 8 OR MORE RIDERS ON A MEGA SAFARI – THE ORGANISER RIDES FOR FREE!! MIDWEEK DEAL – BOOK A QUAD SAFARI AND ADD AXE THROWING, ARCHERY OR AIR RIFLES FOR JUST £10PP! Only £10pp deposit required to book! Safari On & Off Road – up to 6 Miles Of varied terrain tracks. Add Sausage & Chips in the restaurant for just £5.00! Safari On & Off Road Up to 8 Miles Of varied terrain tracks. Take Your Quad Through Some Extreme Terrain – Hills – Expect lots of Mud & Water!! Experience Photo Uploaded to Facebook. Safari Off Road Up to 12 Miles Of extreme terrain tracks. Overalls & armoured gloves Included FREE! 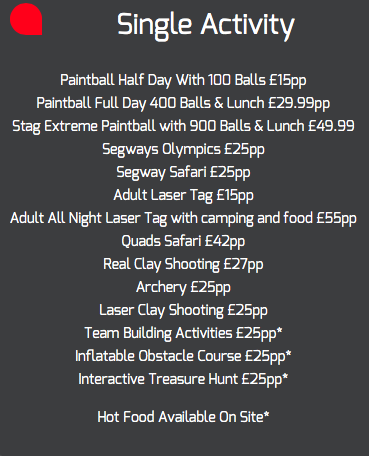 To Book A Multi Activity Package Either Enquire Online Or Please Call The Office 01392 247 442.